This document outlines a suggested process to select a professional retirement plan advisor, or to perform due diligence on your current advisor. 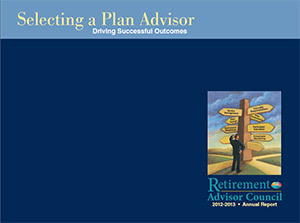 The Retirement Advisor Council developed the protocol and the accompanying advisor search RFP template over a ten-month period between July 2011 and May 2012 with input and feedback from Asset International, publisher of PlanSponsor Magazine and PlanAdviser Magazine, and the Plan Sponsor Council of America. The document is the result of months of hard work by a dedicated Cabinet of advisors, service providers, and investment managers collaborating to enhance plan and participant outcomes. The Council intends to periodically review the protocol and the advisor search RFP template to keep it current. We welcome user feedback and suggestions that will enhance the effectiveness of the RFP process. Knowing no document meets the unique needs and characteristics of each plan, the Council produced the advisor search RFP document as a customizable template. One approach for you to demonstrate your exercise of plan sponsor due diligence is to orchestrate a review of the template by the retirement plan committee, incorporating input from all members before issuing the RFP document. The reason or reasons that led you to issue a Request For Proposal. It is particularly important that you state if dissatisfaction in any area was a factor in your decision to issue the RFP. If so, the responding advisor can explain how s/he would address the particular situation and you may base your decision upon the response. The deadline by which you want the advisor to respond. Longer lead times make it possible for advisors to give more thoughtful responses, enhancing the quality of your decision process. Outline the services you anticipate receiving from your advisor. Differentiate between services you expect any advisor to provide to your plan, and services that might set the better advisors apart. Also indicate areas for which you believe you will not need assistance. Indicate any advisor characteristic or credential that will automatically disqualify an advisor. In what form you prefer to receive proposals, how you want the proposal organized, and what content you are looking for. Indicate the factors that will play a role in your evaluation, and the relative importance of each. The Council is governed by an Executive Board of five representing advisors, retirement practice leaders, service providers and investment managers. The Council welcomes constructive user feedback to help enhance the effectiveness of this protocol and the Advisor Search RFP Template at our periodic reviews.